For all this ridiculously hot summer weather you would think I would be living on salads and fresh fruit, very healthy, very good for the waistline. But no, today was a bit of a calorie fest as I finally tried a couple of recipes which I have been hankering to make. Since starting to blog (and indeed before!) I have been checking out others blogs to see what people are cooking. I find it a fabulous source of inspiration, it is great to see how others cook, bake and choose recipes. I have my favourites of course, which are listed as links here on my blog and do visit quite a few others too, but if I went further than that I know I would be at my computer all day! I came across todays recipe on George's blog "Culinary Travels of a Kitchen Goddess"- spied it a few days ago and knew I was going to have to make it. Especially as she had kindly sent me some mexican cocoa powder, which looked so much nicer than the bog standard supermarket brand I usually buy! It was so much darker in colour and had quite a different smell to it, so I have been gagging to use it in something that would do it justice. This certainly fit the bill, the cake is light (I think the buttermilk works wonders there, plus it gives it a different flavour! 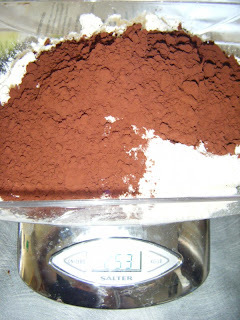 ), has a depth of flavour which I am positive can mainly be attributed to the cocoa powder, everyone who tasted it proclaimed it to be quite different, spicy and with a hint of cinammon. I find I can't eat much of the really fudgy, dense chocolate cakes and the lighter texture of this cake made it so much more attractive! I am not going to repeat the recipe here, you can visit George's blog for that! Here's the link!http://culinarytravelsofakitchengoddess.wordpress.com/2008/01/10/divine-by-name-divine-by-nature/ I made the whole thing in my Kenwood mixer (I actually whipped the egg whites and sugar first and tipped them into a bowl and put them aside, so that I could use the mixer for the whole thing), I made it in one tin and cut it in half and put cream and tayberry jam (which is very tart, probably the same kind of effect as George's cranberry jam) in the middle. I used a shot of espresso instead of powdered coffee (such a thing has not lived in my house for many years! Real coffee only I am afraid! 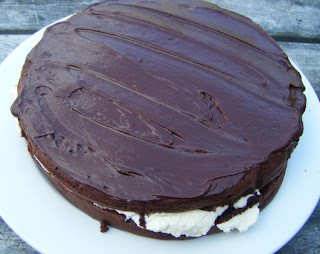 ), I topped it with the sour cream ganache but used dark chocolate -I have never made sour cream ganache before and it was beautiful, what I most liked about it was the ready to ice consistency of it, I find with cream ganache I always have to pop it in the fridge for a bit to get it thicker and spreadable. Anyway, thanks George for the inspiration and the recipe, I will be making it again! This looks pretty decadent and delicious, Linda! 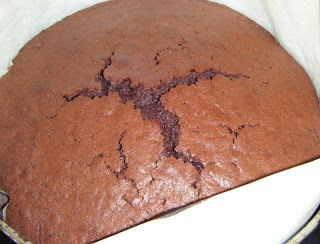 Ooh now I want to bake a cake...I really shouldn't read all these food blogs on an empty stomach LOL!